You want that internship—badly. One of the first steps you'll take toward nailing it down is a knock-the-ball-out-of-the-park, awesome resume. You want it to be perfect, and that begs a couple of questions. How do you get everything you want to say on just one page, and is a two- or three-page resume really a problem? Does the length of a resume really matter that much to employers? They're all good questions, but unfortunately, there isn't one easy, pat answer. Your resume should reflect your education and professional experiences. For college students' resumes, this means relevant classes, volunteer work, and activities can all be included. In fact, you may have to include all this just to get your resume to fill one page if you don't yet have extensive work experience. But what about your high school and the writing you did for your school newspaper? Maybe you've played sports since junior high and you won some pretty distinguished awards along the way. It's hard to just throw all that hard work away. The key to resume writing is relevance. Is the experience you want to include relevant to the internship or position you're applying for? High honors and awards are usually a good idea to keep on your resume, at least for a period of time. They reflect your dedication and how well you are able to perform. But by the time you're a senior in college, you might want to begin leaving out some, if not all, of your high school experiences. You can pare down your resume in a number of different ways. Remove some of the experiences; shorten your bullets; remove unnecessary words and articles such as a, an and the; and limit your experiences to those that are relevant to the position you're applying for. If you’ve done all of that and your resume still goes over by just one or two lines, try changing the margins or change the empty spaces between categories to a smaller font. 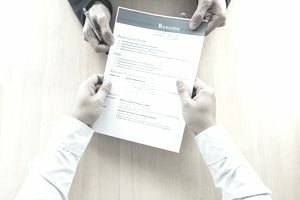 But if your resume is full of education, relevant experiences, volunteer and community service activities, publications, workshops and training, and computer and foreign language skills, you may need to create a two-page resume. If your resume does go to more than a single page, be sure to put your name and "page 2" on the second page. If you go over to a second page, try to fill up at least 75 percent of it. A one-page resume is ideal if you can include all the relevant information you want to get across to the employer and convince that company that you're the best candidate for the job. Your focus should be on what the employer would want to know about you. If doing a one-page resume means you're leaving out a great deal of information that could determine whether you ultimately get the internship or job, then opt for that second page.